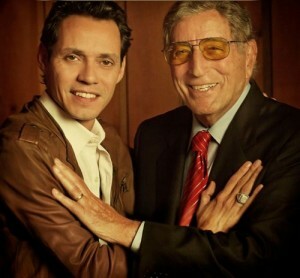 Legendary crooner Tony Bennett hit the big time with his inaugural ‘Duets’ collection back in 2006. It gifted the singer his highest ever album chart position in the US after an incredible 55 years in the business and went platinum both in the States and here in Australia. The second volume (‘Duets II’) was released late last year and became the singer’s first mainstream US No.1, peaking inside the top five around the globe, including here in Australia, where it’s since been certified double platinum. Now there’s news that a third volume is on the way – and this time, he’s teaming up with some of the biggest names in Latin music. Guesting on ‘Viva Duets’ are the likes of Gloria Estefan, Dani Martin, Miguel Bose, Robert Carlos and former Mr.J-Lo Marc Anthony (pictured, above). Though further details (including final tracklisting) are still forthcoming, ‘Viva Duets’ will be released in Australia on Friday October 26.